Whew, I see the entire metro area is in the low 50s at this hour. Time to turn on the heat, or at least it will be by morning. Hard to believe that just yesterday I was standing on my deck watching the sunset in a lot less clothing (but I did have some on!) with a warm easterly wind blowing. That’s all history now. As expected the total precipitation has been pathetic so far. In this setup the main action should be in the convective showers behind the cold front tomorrow. Even then we won’t get huge amounts of rainfall. I’m still a bit under the weather tonight; funny how I felt better over the weekend then feel worse after coming back to work. What’s up with that??? Moving on…after the cool air departs Wednesday, we get into a slightly warmer westerly flow Thursday and Friday. Then another cold trough digs down directly over us Saturday. This is a pattern that would give us waves of cold air and chances for snow if it was in mid-winter. But it’s not, so just another cooldown for Saturday. After that ridging builds in for warmer weather Sunday and beyond. This entry was posted on Monday, September 28th, 2009 at 10:48 pm and is filed under Weather. You can follow any responses to this entry through the RSS 2.0 feed. Both comments and pings are currently closed. …hey, um…this seems kinda important…. WATER… OFF THE BEACH AND OUT OF HARBORS AND MARINAS. AMPLITUDES… HISTORICAL INFORMATION AND FORECAST MODELS. AMPL – TSUNAMI AMPLITUDES ARE MEASURED RELATIVE TO NORMAL SEA LEVEL. IT IS …NOT… CREST-TO-TROUGH WAVE HEIGHT. OUTSIDE THE STATES AND PROVINCES LISTED ABOVE. also, snow on the ground at Gov’t camp! that cell over longview is INTENSE! it is LOUD out there. and cold, got 45 at the house. Because of that hail storm just before 5 my rainfall total for the day is now up to 0.75″. Still have hail on the deck and lawn…90 minutes later. Nice strong cell south of Gresham moving towards Boring. Wouldn’t be surprised if there were some additional lightning strikes with this. I did hear at least one strike on AM radio from that cell. …i was in Carver when that one blew thru….brief hail outburst, but didnt see lightning or hear thunder…. I heard that big tsunami killed nearly 40 people. Alright, what ever just hit me is some sort of thunderstorm. No thunder, but this shower started with winds that seemed like 40+ mph and now I am having VERY heavy rain/hail. Big downpour in progress here as well. Just had an intense, short lived, hail storm. Saw a couple flashes of lightning. Temp cooled down to 51°. No rain since that noon downburst and the classic brief gusty winds……………who needs the rain anyways. Well im taking a nap now, see ya in a little bit. Radar now shows this squall weakening in terms of reflectivity. But it might still pack a punch, who knows. Not surprised Yevgeniy, glad you got to see one, I was hoping today I would actually take a snap shot of one but my chances are almost gone if these storms remain east. Well, we are getting closer to that if this continues… Remember September 6th folks, anything can happen at this point. Boy do I dream alot! …just had a nice flash of lighting here…. Thanks, looks like this line is now a squall, officially. Any wind? …just the standard brief gusts and heavy downpour…..
No T-storms in this area to be found but we had steady rain around noon that brought me .16 of an inch. Temp has finally climbed to 59F.2F I still have 1 hour to go before I call it a highs-in-the-50s day. Recent lightning strikes near Salem and Astoria. Several others around as well. *Possible t-storm just east of Tigard and west/northwest of Oregon City. Looks like we got thunderstorms. Not bad. …annnnd that was over in less than two minutes. I was busy today, did I miss anything at all since my last comment? did any showers look impressive on radar? gotta love this time of year…downpour moved through while i was getting my haircut, come out and its bright blue sky overhead, dark ominous clouds to the east, building puffy clouds to the west, and 2 miles away at my house, dry pavement. a lot like spring…now if we could just get some T&L it would be fun. It is now partly cloudy with CumulusNimbus building to my NW over the neighbors house. KPTV Special Emergency Storm Chasing bicycle. Lol That’s great. 🙂 I’d like to see a pic of such a device. Heard there is a tsunami watch for Hawaii after the earthquake in American Samoa. Anyone hear if anything happened? 8.3 quake. I heard there are reported fatalities now coming in from American Samoa. 😮 *Almost crashes the KPTV Bicycle* No I haven’t. PALMYRA IS. / VANUATU / NAURU / MARSHALL IS. / SOLOMON IS. I just checked SPC Thermodynamics. Also some favorable 400-250 mb Potential Vorticity Advection. All in all I’d say chances for more vigorous showers and possible isolated t-storms increase after 1:30 PM. Oregon AMS “What Will The Winter Be Like” Annual Weather Meeting! 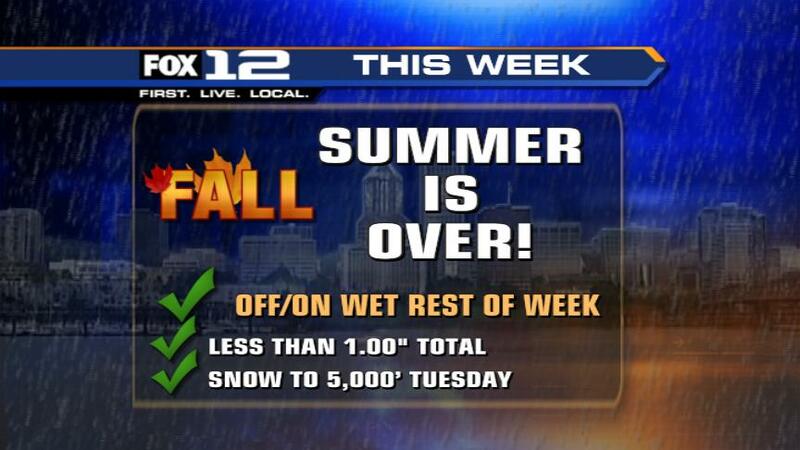 Will we see another mega-snow winter for Portland this year or will El Nino spoil the fun? The 17th annual event is locked in and ready to go. There were 200 people there last year and we will likely see as many (or more) again this year! Don’t miss it! For complete details, including a driving directions, see link below, or text version here! There will be a self-ordered lunch / social event immediately after the meeting in the OMSI Cafe for those who want to talk with the presenters. Raining at a pretty good clip up here. Looks like this is the last major band of rain before things clear out some. Maybe enough sun for some thunder later today. This gives you an idea of where the snow level is up here. Looks like the sticking snow didn’t quite make it down to Stevens Pass, but you can see it 100′ or so up the hill :). Some snow on the mountain cams this morning. 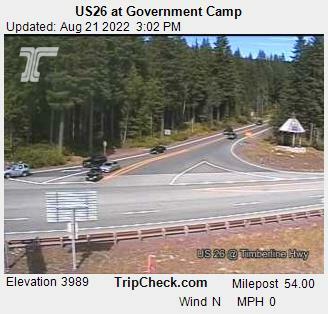 Looks like TImberline got a dusting, as did Mount Rainier and other areas mostly above 5,000. Government Camp is in the mid 30s so it was close there. it was actually snowing up at G-camp early this morning. . . only wish I was there! 2007. . . from the weather chat. . . .
Hmmmm. . . . got down to 44.3°F around 3:40 this morning (nice!). . . . Currently 50.2°F and cloudy with a light, steady breeze. . . .
Radar’s showing a nice heavy batch of rain coming over the SCR, heading west. . . Let’s see if the SCR hogs it all. . . .
SCR does look hungry, but we’ll see. I refuse to turn on the furnace, well I will try to hold out untill Oct. 1st. Good looking cell NE of Yacolt, WA. Peak 56.5 dbz. I’d say the first lightning strike (Somewhere in either SW Washington or east of the Coast Range in western Oregon) will be 10 AM-Noon. Mark, thanks for the update and get to feeling better. Mhm… Yes. Very interesting…. Ah hah! Yep. My conclusions are that a rumble of thunderage is possible. Mostly cloudy here right now, 43 degrees. Haven’t had a shower yet, but radar shows in the last 3 hours we came close a couple moderate ones. SPC Convective Outlooks suggest storms for pretty much everywhere west of the Cascades. 29° at the top of Hoodoo this morning. 45.2° here this morning, just had a short lived heavy shower pass by, 0.10″ of rain so far today. No wind! . . . . and just starting to snow, or “slush”. . . .
Snowing at Timberline. . . .